If you are looking for a place to call your temporary home anywhere in the Tampa Bay area, Elite Housing Solutions has just what you are looking for. Our corporate housing in Tampa offers much more to the business or pleasure traveler than a hotel. Our corporate housing in Tampa is the ideal accommodation for those who need more space and comfort for business travel needs than a tiny, cramped hotel room can provide. But that is not the best part; our corporate housing in Tampa is typically up to 50% more economical than that common hotel space when you compare all of the costs associated with a temporary living situation. If you are going to be away from home for 30 days or more, you must be looking for comfortable corporate housing in Tampa. We have already established the fact that the hotel or even an extended stay hotel is not the answer in Tampa. We have the answer and we provide numerous corporate housing in Tampa options from luxurious penthouses in exclusive neighborhoods, to the very basic yet well appointed and maintained apartment community. The best thing is, all our corporate housing in Tampa options are located within the area you need! The bottom line here is that our experience in the market ensures that Elite Housing Solutions knows everything about corporate housing in Tampa and just what you need to feel right at home while you are here on business or pleasure. Oh, did we mention that if you find hotels to be cramped, then the intelligent choice for your short stay is again our corporate housing in Tampa situated within safe secure apartment and condo communities. You see, hotel rooms are typically about 300 square feet of space or even less, with no room to move around and be comfortable. You will be happy to know that our typical corporate housing in Tampa floor plan generally has no less than 750 square feet, more than twice as large as most hotel rooms, and that is just the one bedroom apartments and condos we offer. 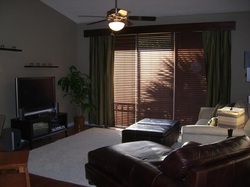 Our two and three bedroom corporate housing in Tampa options are as large as 2500 square feet. Another feature you won't find in a hotel but will find in our corporate housing in Tampa are washers and dryers. This eliminates the need to either spend money on dry cleaning, or sit at the coin operated laundry facility for hours waiting for your clothes to be washed and dried. All of our corporate housing in Tampa also include full size kitchens with all the dishes, pots, pans, utensils and other items you typically find in every home, allowing you to save considerable money cooking your own meals in the comfort of your own home. These corporate apartments also provide personal amenities such as fitness centers, business centers, pools and some even have tennis courts and volleyball courts and all are close to attractions in the Tampa area. Rest assured, Elite Housing Solutions has first-rate options for your corporate housing in Tampa that are economical and convenient, whether it's for 30 days or several months at a time. We are excited to have the opportunity to serve you and your needs so get started by calling Elite Housing Solutions today at 813-626-7772 for your corporate housing in Tampa needs or fill out our contact form and we will contact you.